After a week of hype surrounding the most highly-anticipated Final Four in years, let’s do a reset on each of the four teams still standing. Today’s victims: We’ll start with Duke and finish the day with Kentucky. Wisconsin and Michigan State were published yesterday. South Region Champions. During the NCAA Tournament’s first weekend in Charlotte, the Blue Devils used friendly surroundings to coast by #16 seed Robert Morris and #8 seed San Diego State; Coach K’s team led the Colonials and Aztecs by double-figures in all 40 second-half minutes of those two games. Advancement was tougher at the South Regional in Houston, but Duke managed to break open close games against #5 seed Utah in the Sweet Sixteen and #2 seed Gonzaga in the Elite Eight, landing the Blue Devils a trip to Indianapolis this weekend. Mike Krzyewski. Like the other three coaches in this year’s Final Four, you already know Mike Krzyzewski. Unlike the other three coaches in the Final Four, there is no college basketball coach you know better than Mike Krzyzewski. Coach K’s list of accomplishments — 1,016 career wins, 12 Final Fours, four National Championships – leave him with little to prove. Can the longtime Duke head coach, in the twilight of his career, outmaneuver two of college basketball’s best (Izzo and either Calipari or Ryan) this Saturday and Monday nights? For the seventh season in a row, Duke has an offense that ranks among the top 10 nationally in adjusted offensive efficiency. However, unlike most of those other attacks, this year’s version works from the inside out. Krzyzewski-coached teams have classically thrived from beyond the arc and this group certainly doesn’t struggle there either (39 percent), but Jahlil Okafor has transformed the Duke interior. The freshman All-American is the major reason why the Blue Devils made 56 percent of their two-point field-goal attempts this year (fourth-best nationally) and remains the clear focus of the offense. Defensively, Duke remains a man-to-man team. Midseason struggles in stopping penetration prompted a brief flirtation with a zone (which wasn’t necessarily unsuccessful), but Quinn Cook has spearheaded a significantly improved man-to-man approach during the latter half of the season. Offensive Poise. Duke’s calling card this season has been its offense. Only Wisconsin and Notre Dame have produced offensive efficiency numbers better than that of the Blue Devils, statistical proof of a cohesive and gifted collection of offensive talent. Even in hostile road environments at Wisconsin and Virginia, the youngsters – Okafor, Tyus Jones and Justise Winslow — have never gotten overwhelmed by the moment, a trait that should serve their team very well on Saturday night. Beyond the Arc Efficiency. Duke has done a great job from behind the three-point line on both ends of the floor. The Blue Devils are making 39 percent of their own three-point attempts, with every starter other than Okafor converting on better than 37 percent of their long-range efforts. Duke’s opponents have not found their touch contagious, however, as Coach K’s group has limited opponents to a much chillier 31 percent shooting from beyond the arc. Closing Out Wins. Duke’s overall free throw shooting statistics are unimpressive (largely a result of Okafor’s struggles at the line), but no team has a better pair of free throw shooters available to close out games. Primary ball-handlers Tyus Jones and Quinn Cook both shoot a blistering 89 percent from the line, making Duke a near-impossible team to beat if an opponent finds itself in a must-foul situation late. Do your work early against the Blue Devils because they will close you out late. Depth. The midseason dismissal of Rasheed Sulaimon crippled an already short Duke bench. The Blue Devils rank 308th nationally in percentage of bench minutes, a metric that overstates the recent production they have been receiving from their substitutes. Big men Amile Jefferson and Marshall Plumlee have provided good minutes at times in this year’s NCAA Tournament, but Duke’s bench has scored only 12 total points in its last three contests. Avoiding foul trouble is crucial for the weekend success of the Blue Devils. Rebounding. 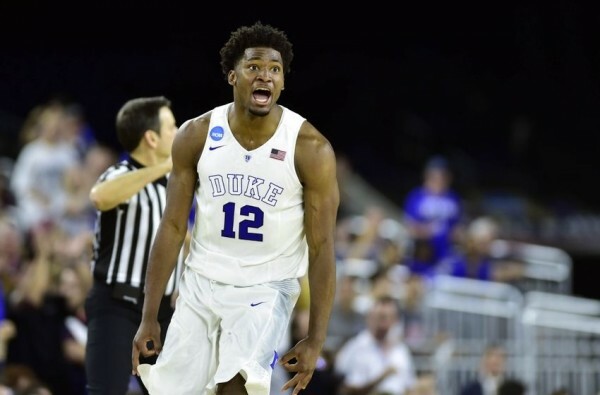 Justise Winslow’s move to power forward has undoubtedly sparked Duke, but Coach K is sacrificing some efficiency on the backboards with the switch. The Blue Devils weren’t world-beaters on the glass with Jefferson starting at the four, but Winslow’s slide to the other forward position places even more pressure on Okafor to clean up opponents’ misses. Duke ranks just 132nd in the country in defensive rebounding percentage. Jahlil Okafor (17.5 PPG, 8.7 RPG). Okafor was stifled in Houston (where he averaged just 7.5 PPG), but Duke’s offense hasn’t suddenly refocused around anyone else. The most polished post player in the country – as a freshman – is poised for a bounce-back performance in Indianapolis. Okafor has made an insane 67 percent of his 400 field-goal attempts this season. Count on Michigan State to do everything it can to keep that season attempt number as close to 400 as possible. Matt Jones (6.1 PPG, 0.9 SPG). Duke’s reality is that four players (Okafor, Jones, Cook and Winslow) play major roles with little hope of help from elsewhere. That said, the best candidate to pitch in with a key role of his own is the fifth starter, Jones. He played the game of his life in Sunday’s regional final against Gonzaga (16 points, 4-of-7 3FG), and while similar contributions shouldn’t be expected this weekend, Jones has the stroke and athleticism to punish the Spartans if they completely forget about him. 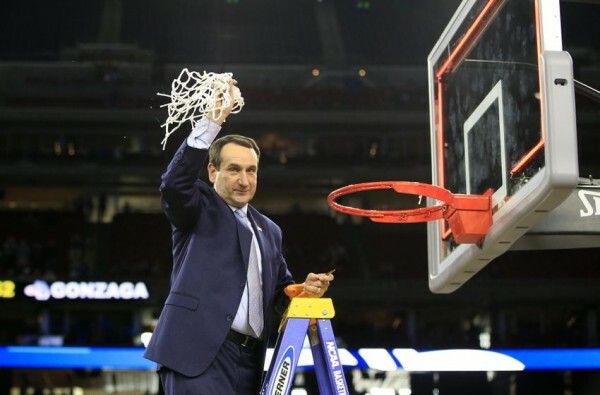 Mike Krzyzewski and Duke don’t arrive at Final Fours without serious National Championship aspirations. Those hopes are as earnest as ever this weekend, even with vaunted Kentucky lurking as a potential Monday night matchup. The Blue Devils are decided favorites to reach the championship game even if we count Michigan State as this March’s team of destiny. Overcoming Tom Izzo’s club won’t be easy – the Spartans have proven as much in the last month – but expect the Duke quartet to outplay the Spartans lead trio of Trice, Valentine and Dawson and lead the Blue Devils into Monday night’s title game. And whether it’s Kentucky or Wisconsin that Duke will face there, that’s when the real chore will begin. This entry was posted on Friday, April 3rd, 2015 at 9:01 am by Bennet Hayes	and is filed under 2015 ncaa tournament, fact sheets. Tagged: acc, coach k, duke, feature, final four, grayson allen, Jahlil Okafor, justise winslow, matt jones, mike krzyzewski, quinn cook, south regional, Tyus Jones. You can follow any responses to this entry through the RSS 2.0 feed. You can leave a response, or trackback from your own site.